Arkham House, 1962; 174 pp. ; limited to 2000 copies. First Edition. 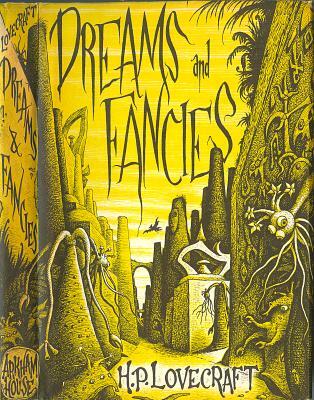 Dreams and Fancies is a collection of letters and fantasy, horror and science fiction short stories by American author H.P. Lovecraft. It was the sixth collection of Lovecraft's work to be released by Arkham House. The concept of the collection was to present letters by Lovecraft recounting dreams, and the stories which may have derived from those dreams. It also includes fragments of letters from Lovecraft to various correspondence in which his dreams are discussed. Book is solid and clean, without bumping; black binding cloth is clean and shiny; gilt lettering on spine is bright; pages are clean. Dust jacket front is clean, bright, and unblemished; flaps are clean and bright with original price ($3.50) unclipped; rear cover is clean and bright; spine and top edge are very lightly age yellowed (see image above).